In Italy the presence of foreign students is a structural matter and concerns the entire school system. For this reason, it is necessary to identify best practices and spread them according to the Educational Plan offer and the school autonomy, in agreement with local authorities and other institutions that interact in the territory to develop integration. Intercultural education is the premise of the specificity of training courses for foreign students. And the school is the central place for creating and sharing common rules, because good practices can be put into action in everyday life and historical, social, legal and economic knowledge can be transmitted to students. The Institute "Sassetti – Peruzzi" is located in an area with the presence of many non-Italian-speaking families, who are mainly of Chinese origin. For this reason, last year the school decided to start an experimental project with two parallel classes with the aim to linguistically strengthen both groups. One class had pre-basic/basic linguistic level students whose mother tongue was Chinese, and the other with students of B1-B2 level of Italian, of various origins (Italian, Chinese and other nationalities). The basic-level and mono-ethnic class would have a support teacher for economics and law. The two classes would then participate in visits outside the school, movies and other activities in order to integrate students of Chinese origin with the others. It has to be said though that, due to internal reasons (change of ongoing classes, withdrawal of students of legal age, the alternation of several teachers on the same chair, support teacher arrived only in February), the two classes have shared various activities, such as visits to get to know the neighborhood. 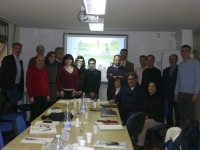 The teachers of Italian have also worked together on the same topics. Welcome: Chinese students were welcome and introduced in the school with the help of a support teacher, COSPE experts and University students who perform training periods of approximately 150 hours to follow our students, led by regular teachers. Filling out questionnaires on the competences in L1, bilingual, administered to all students in the first year; Italian students did them in English. Between September and November literacy courses for multiple language levels were carried out (pre-basic and A1 which will continue in January/February, A2 and two courses at different levels to develop writing and text comprehension skills, one at basic and one at advanced level, for students in the last three curriculum years). On the day of general discussion with families, the parents of the Chinese students were summoned in the morning and, with the help of the mediator, critical issues for the students were brought up and discussed both by the school and by parents, although few Chinese parents turned up on the day. A partnership with COSPE (the main interlocutor for integration problems) was issued. The school joined a partnership with the vocational technical school N.2 in Rui'an in the district of Wenzhou and it has been suggested to organize an exchange with China in the next school year. Relationships have also been developed with the S. Egidio community. They proposed meetings with parents of the foreign students, study aid given by students in the first two years of the upper-secondary school to primary school students, and meetings on topical issues for the students in the last three upper-secondary school years. Message: Every year our school receives a certain number of students from foreign countries (Slavic countries, North Africa...) without school background nor any knowledge of the French language in an education system they know nothing of. Those students need targeted support. In order to help them integrate quickly and be able to follow the curriculum, we organise French classes for “newly-arrive students” (who have recently arrived in Belgium) two hours a week. This system is no panacea, but in its way it can improve integration and fights part of early school leaving. Message: At our school – Liceul Teoretic “Dr. Mihai Ciuca” Săveni there are no so many immigrant students, except students from Moldova Republic. Because they come from a country inhabited all the Romanian majority and the official language is all Romanian, Moldovan students teach us face fewer problems than other immigrant students. Why? For the first obstacle in the integration of immigrants is that does not speak of his new homeland. I have a student in my class came from Moldova, its name is Anatol. It is a good kid, a student worker, ambitious and his colleagues loved him quickly because he is generous, patient, intelligent. It is true that in the first year Anatol cause smiles through its focus but now we are all familiar with. He lives in a boarding school. Although coming from a family of modest means, Anatol receive a scholarship offered by the Romanian state, so for him were not very big financial problems. Now Anatol is the final year in high school and is preparing for admission to college. He wants to continue their studies in Romania, because, he says, he feels at home here. Anatol is an example of successful integration of an immigrant. Message: The experience received from the colleague of the Sassetti-Peruzzi Institute is very significant and courageous. It is based on the awareness of the difficulties in having levels of linguistic competence strongly opposed and different among the students, and on the ability to organize two classes with similar level, but with different programs, maintaining – at the same time - some points of contact between the two parallel classes. The achievement of the objectives for each language level is finally ensured, and, at the same time, situations of separation are avoided. Both groups are guaranteed the right to meet the objectives according to their levels of proficiency. The educational and integration activites between the two groups are effective, especially in those areas where language proficiency is not necessarily a priority, but rather mutual knowledge and socialization are required.